Patriot Box Office High Definition Media Player is an All-In-One Media Player which supports 1080p playback from various files sources such as VOB, H. 264, ISO, WAV, etc. 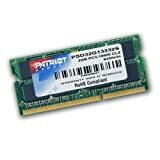 Patriot Signature DDR3 1333 MHz Non-ECC Unbuffered SO-DIMM is designed to support high performance notebook and mobile systems. Patriot SoDIMM memory modules are fully tested and validated at 1333MHz (PC3-10600) to ensure reliable performance and compatibility. These memory modules are perfect to meet the needs of those requiring memory upgrades.